When physical therapy hasn’t worked, when injections haven’t worked, and you feel you’ve exhausted all other options for your aching joint, you may be looking at joint replacement surgery. This was certainly the case for patient Dennis Edwards of Pulaski. Dennis Edwards’ pre-op x-rays, showing the old screws from his first surgery. Dennis was in an accident in 1994 that left him with a badly injured ankle and a poor future prognosis for complete healing. Dr. Eslick Daniel performed the original reconstructive surgery on Dennis but advised that he would eventually need an ankle fusion. 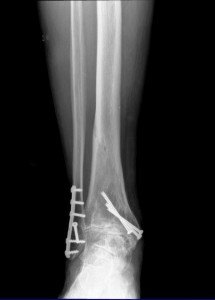 Because pain is typically made worse with movement of the ankle bones, an orthopedic surgeon will use screws to join the bones together to reduce that movement. The patient will generally see a reduction in pain, but range of motion in the joint is also limited. Fast forward 23 years, and Dennis began to realize that his continuous ankle pain was becoming simply too much to bear. “This past summer, the pain worsened to the point that it was keeping me up at night. It was just bad, sudden pain when I was walking or resting. It never stopped,” said Dennis. A visit to Dr. Randy Davidson at Mid-Tennessee Bone and Joint resulted in a series of cortisone injections, but relief only lasted about two days before the pain would come back. At that point, Dennis knew he would have to explore other options. 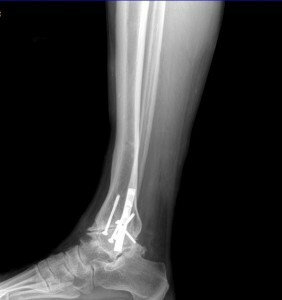 Dennis Edwards’ post-op x-rays, showing the new replacement joint. Dr. Davidson has been very encouraged by Dennis’ progress. Instead of having to be in a cast for three months, he was able to transition from a cast to a brace after just two weeks. Two weeks post-surgery, Dennis could already tell a difference in his ankle. “I think any pain I’m feeling right now is coming from the staples they put in after the surgery, instead of from the bones like it used to. I have a high pain tolerance, but I can tell a huge difference in how I felt before surgery and how I feel now,” he said. “I’ll do physical therapy at home for about a month and then I’ll come back to the clinic for some more therapy. Overall, my recovery has been great. It’s just hard to be patient when you’re a patient,” he said. 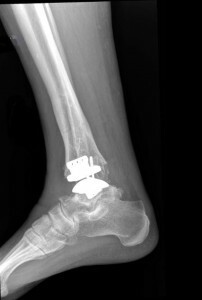 3 Responses to "A New Trend – Total Ankle Replacement"
I was in a bad car wreck in 1979 – my ankle was almost reduced to powder I was told – I didnt get it fused and have been dealing with pain and misery ever since. I am now 66 – I have severe pain after walking any distances – my husband suggested “amputation! On Medicare and really looking for help! Susan, you may contact our office at 931-381-2663 for an appointment! 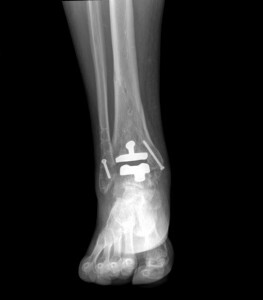 It’s good to know that ankle replacement surgeries only require a short period of recovery time, paired with therapy to get used to using your joints for moving. This is because my aunt has been suffering from acute arthritis for years that she always ends up lying in bed only to alleviate the pain. I know that she cannot do this forever and that the problem in her right ankle needs to be solved, which is why I’ll be talking to my mom to assist her in seeking the help of an expert to assess and consider possible surgeries to be performed, if necessary.